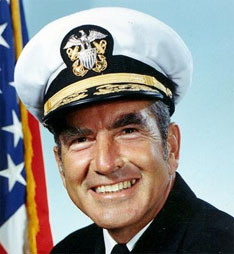 AKA Elmo R. Zumwalt, Jr.
Elmo Zumwalt was the United States' Chief of Naval Operations from 1970 to 1974. At the age of forty, he was the youngest Chief of Naval Operations in United States history. During his tenure, Zumwalt's "Z-Grams" removed many old rules about dress code in the Navy, including the permitting of beards and long hair. Zumwalt ordered the spraying of Agent Orange on Viet Cong foliage during the Vietnam War; after learning about its effects on humans, he acted in vain to protect his fellow officers and son, who was in the military at the time. Tragically, his son produced a child with a severe congenital birth defect (the still-living Elmo R. Zumwalt IV), and later died of cancer from exposure to the poison. While Zumwalt later regretted its exposure to American soldiers, he never regretted the actual act of spraying the defoliant, claiming that it saved more lives than it cost in the long run. Thousands of Vietnamese children suffer from major birth defects due to environmental contamination. Zumwalt later ran for Senate against Harry F. Byrd, Jr., who was serving as an "Independent Democrat" at the time. He lost in a three-way race, 57.20% to 38.27%. Zumwalt died in 2000 at the age of 79, having done fatal damage to his lungs from exposure to asbestos while serving in the Navy.